Stuart has a friend who often invites him to go to Dallas Cowboys games with him. They have lots of fun tailgating before and after the game. But what a treat! This time Mark invited Stuart to the game against the NY Giants and asked if Nicholas might want to come along too. 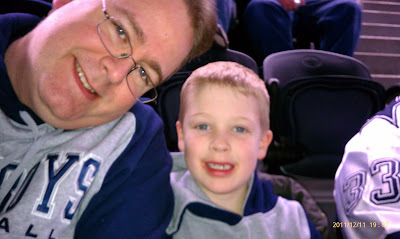 So we got Nicholas a Cowboys sweatshirt and loaded up some tailgating food and the boys had a great time. They grilled burgers and snacked on chips and cookies before the game. Nicholas was really excited to be at the game and had a great time. He doesn't watch much football so Stuart had to explain a few things to him. I love it because I remember having so much fun tailgating with my Dad and his friends at LSU football games and I remember him having to explain a lot of things about what was happening on the field. I may not have understood much about the game but those are cherished memories for me. I'm so glad that Nicholas got to make some special memories with his Dad at a Cowboys football game. The only thing that would have made it better was if the Cowboys had won!